I have been wondering how I should share the delectable plant-based eateries we’ve so enjoyed in Stockholm. There are so many. They are so beautiful. And I have so many photos of them. As I work on that project, I realize there is one plant-based restaurant in Stockholm that I must share with you immediately. Because, with Christmas feasting upon us, I need to tell you: of all the cafes and restaurants we’ve visited in Stockholm, walking into Herman’s has felt like walking into a beloved family member’s home. There’s even a cozy stairwell inside, with photos lining the wall. Herman’s food presentation is impeccable. Herman’s people are so very kind. Even Herman’s dining room looks, oh, so comforting. Like arriving at Grandma’s house for a holiday meal. And just like at family gatherings, there was a line of hungry visitors (right behind us), inhaling all of Herman’s sweet and savory smells. This is where we dished up spoonfuls of nearly every delicious offering laid out on the table (as most of Herman’s food was also gluten-free). 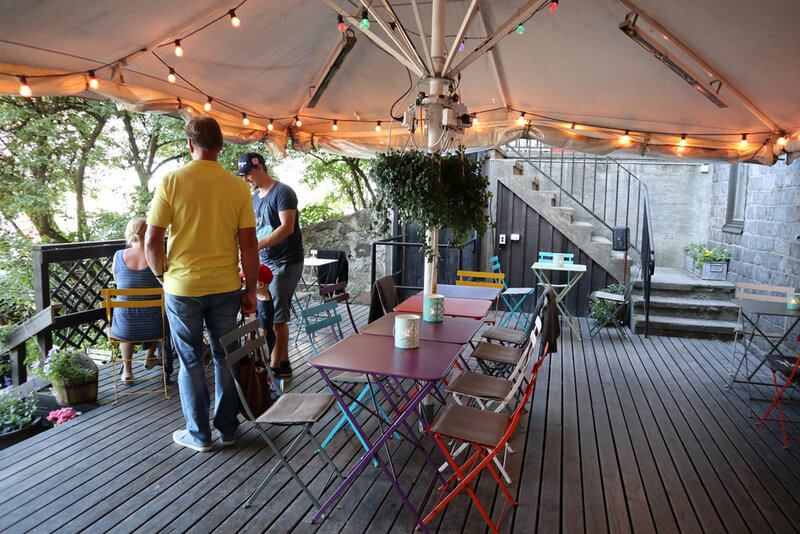 We could even sink into Herman’s grassy hillside oasis, overlooking Stockholm’s water view. It was so overwhelmingly hot outside during our visit that we chose the coolest place we could find to rest and restore. A shaded north porch never felt so inviting. We lingered here at Herman’s. We immersed ourselves in the entire experience. We slowly enjoyed the meal, the ambiance, and the company. And even when we finally walked away, through the back garden, it was so tempting to turn around and stay a bit longer. We will be back, Herman’s. We will be back. 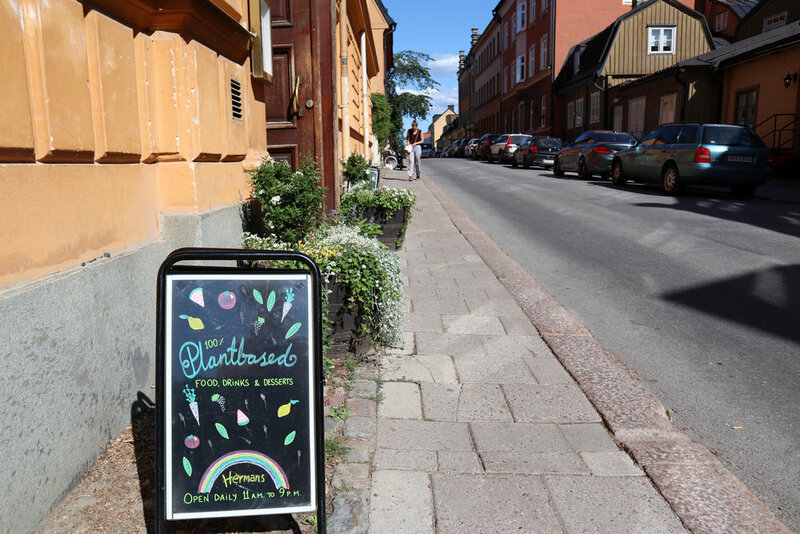 Nearly every plant-based cafe and restaurant we’ve eaten at in Stockholm has been affordable. In fact, Stockholm prices have been more affordable than most prices we’ve been charged in North America. Herman’s is the only restaurant we’ve eaten at in Stockholm that was more expensive, so we know a visit to Herman’s is a special occasion to enjoy. Herman’s feels like home, which makes it a perfect place to indulge in a plant-based Christmas feast. If you hang out at Herman’s for many hours, working online or lounging in the garden, you’re still only paying that one price to eat for hours, as it’s a buffet! Herman’s is well-visited, so at times it might be wise to plan ahead with reservations (like at holiday time). Herman’s plant-based food is so hearty and filling that it’s an excellent place to take meat eaters. Relax into Herman’s…it is a beloved experience, indeed.